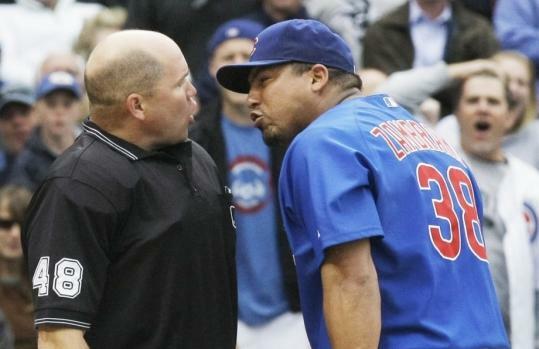 Carlos Zambrano's tantrum kept escalating. The emotional ace of the Cubs went wild, throwing a ball into the outfield, heaving his glove, and then whacking a dugout drink dispenser with a bat. It was an outpouring of anger yesterday in Chicago that likely will lead to a suspension for the excitable righthander. As he argued a close play at the plate, Zambrano appeared to nudge umpire Mark Carlson and was ejected. That set off the 6-foot-5-inch, 255-pound righthander in the seventh inning of the Cubs' 5-2 win over the Pittsburgh Pirates. "I overexaggerated after that play to throw the ball and to do the other things, you know," Zambrano said after the game. "Hopefully MLB will review the play and we'll see what happens." With the Cubs leading, 2-1, and Zambrano closing in on his 100th career win, Nyjer Morgan led off the seventh with a single to left and went to third when the ball got by Alfonso Soriano for a two-base error. When a Zambrano wild pitch bounced a short distance from catcher Geovany Soto, the speedy Morgan broke for the plate. Zambrano went to cover and took the throw. Morgan slid as Zambrano blocked the plate and Carlson called him safe. Zambrano jumped up, argued the call, and appeared to make contact with Carlson, prompting the ejection. He then pointed in Carlson's face and gave him the ejection sign. Zambrano wasn't finished. He threw a ball into left field, slammed his glove against a dugout fence, and whacked the drink dispenser on his way to the clubhouse. "I apologize to him. Like I say, after he kicked me out, I should have gone to the clubhouse and kept watching the game," Zambrano said. "I apologize to throw the ball and do other things." "I'm the only calm, cool, collected one around here it seems," said Cubs manager Lou Piniella who's been known to throw bases and kick dirt during tantrums. "Just kidding." Yankees 9, Rangers 2 - A.J. Burnett pitched six shutout innings to win for the first time in six weeks, Hideki Matsui homered twice, and New York gained a share of the AL East lead by routing host Texas. The Yankees, who have won 12 of 15, are tied atop the division with the Red Sox. It is the first time this season New York has been in first place in the AL East. Derek Jeter was 3 for 4 and reached base five times, and Mark Teixeira added his 12th homer in May. Cardinals 3, Brewers 2 - Nick Stavinoha had two RBIs and scored the go-ahead run to lead visiting St. Louis back into first in the NL Central. Orioles 12, Blue Jays 10 - Nolan Reimold hit a three-run homer in the bottom of the 11th inning to cap a second surprising comeback by host Baltimore, which extended Toronto's losing streak to nine games. Indians 12, Rays 7 - Ben Francisco homered and drove in four runs as host Cleveland earned its first three-game winning streak of the season by defeating Tampa Bay. Angels 3, White Sox 1 - Jered Weaver and Brian Fuentes combined on a five-hitter, Bobby Abreu had two RBIs, and host Los Angeles topped Chicago. Tigers 8, Royals 3 - Rookie Rick Porcello won his fifth straight start, Placido Polanco homered and drove in three runs, and visiting Detroit beat Kansas City. Mariners 6, Athletics 1 - Russell Branyan hit a go-ahead two-run homer in the sixth inning, Erik Bedard won for the first time in five starts, and Seattle won in Oakland to avoid a sweep. Mets 7, Nationals 4 - Host New York benefited from a replay review for the fifth time, with Daniel Murphy's tiebreaking homer coming on an overturned call, and an uncharacteristically wild Johan Santana (six walks) improved to 7-2 by beating Washington. Padres 8, Diamondbacks 5 - Adrian Gonzalez hit his majors-leading 18th home run and drove in three runs, and visiting San Diego defeated Arizona for its 11th win in 12 games. Giants 6, Braves 3 - Randy Johnson earned his 299th victory with six impressive innings, yielding three hits and one run in host San Francisco's victory over Atlanta. Dodgers 8, Rockies 6 - Juan Pierre and Mark Loretta hit RBI singles with two outs during a five-run seventh inning, and Los Angeles then held off host Colorado for a three-game sweep. Reds 6, Astros 1 - Jay Bruce homered twice and Bronson Arroyo pitched a five-hitter to lead host Cincinnati to a three-game sweep of Houston. Marlins 6, Phillies 2 - Burke Badenhop pitched five sharp innings and Dan Uggla and Cody Ross homered for host Florida.